Info > Why Savvy Rest? Sometimes we don't realize how profoundly synthetic substances have affected our lives until we touch something natural. After living with so many products made of materials that are far removed from nature, or are made with chemical formulas or processes that ensure each one is exactly like the next, it can feel almost bewildering to touch something organic, simple, and uncomplicated. But it also can speak to us at a deeper level. Maybe to the child in us that grabbed a handful of grass or touched an animal, before we were instructed that dirt was to be avoided. Surface discolorations, many of which are shown below. The natural scent of the rubber tree plant. Our latex rubber is natural, but it is still latex rubber and will carry the scent of the rubber tree. Most people can't detect it at all, while a small number can. Because "noses" vary so greatly, this is not predictable. Once the layers are closed into the mattress casing, however, very few people mention noticing any scent. If you are very sensitive to odors or have any concerns, please give us a call or request a free latex sample. Slight variations in the feel or appearance, in one part or another. 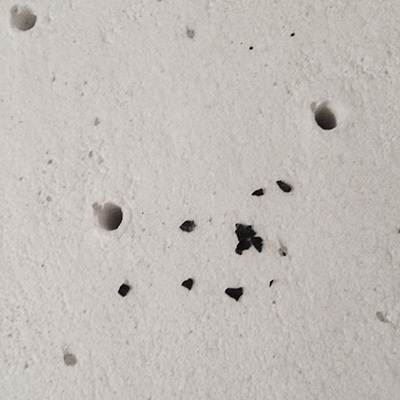 Small dark bits of charred rubber from too-hot baking pins. In natural Dunlop latex, variations usually have to do with smoothness or consistency. Some Dunlop layers will show a thin ridge line, off-centered, from head to foot. This is not a glue line, but an impression left by a seam in the baking mold. Dunlop will also show minor color changes and occasional small tears or "voids." Voids are basically baked-in air bubbles. Talalay may also have some color variations, but more often than not, its imperfections will be small voids. You can see some of these variations below. Discoloration of the latex from the baking process. Slight discoloration of the latex. This is common. Surface indentations on the underside. Small enough to be undetectable. 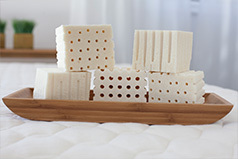 Small voids in Talalay are common but won't affect comfort or durability. Texture variation. The lighter-colored spots are a bit coarser. Inconsistency in surface texture. Within the casing, it's undetectable. Dunlop varies in height, sheet-to-sheet and sometimes within a sheet of latex. Small tear in surface (left). Laid flat (right side, same sheet). 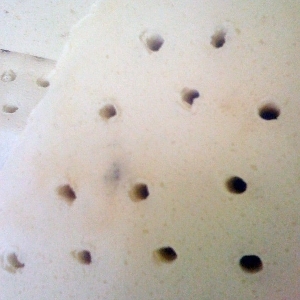 Small specks of latex that have been "burnt" during the baking process. If you take apart your Savvy Rest for a future move, you will see changes in the layers' appearance. The latex may be markedly more yellow or even orange, and the surfaces may have developed a dry outer membrane or "skin." These surface changes result from the natural oxidation of plant material, and will not alter your mattress' comfort or performance. Synthetic latex blends normally contain styrene and butadeine (called SBR rubber), and often large quantities of synthetic antioxidants to forestall yellowing or other cosmetic issues that occur as natural latex ages. If you're concerned about the quality of the layers you'll receive, please read about our latex quality control. We have strict guidelines and take pains to ensure that all the latex layers in your mattress are structurally sound. Despite the cosmetic imperfections in natural latex, it has such wonderful qualities that we firmly believe it's the best material for mattress cores.